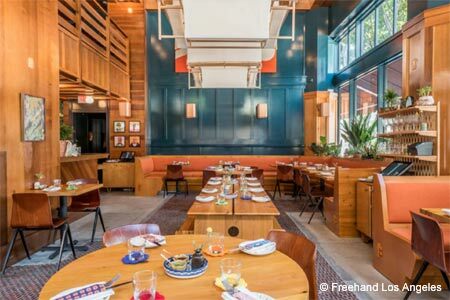 Israeli-influenced fare for breakfast, brunch, lunch and dinner in the Freehand Los Angeles hotel in downtown LA. Open for Breakfast Mon.-Fri. 7 a.m.-11 a.m., Sat.-Sun. 8 a.m.-10 a.m., Lunch Mon.-Fri. 11:30 a.m.-3 p.m., Dinner Mon.-Thurs., Sun. 5:30 p.m.-11 p.m., Fri.-Sat. 5:30 p.m.-12 a.m., Brunch Sat.-Sun. 10 a.m.-3 p.m.
: The Exchange serves up Israeli-influenced fare for breakfast, brunch, lunch and dinner in the Freehand Los Angeles hotel in downtown LA. 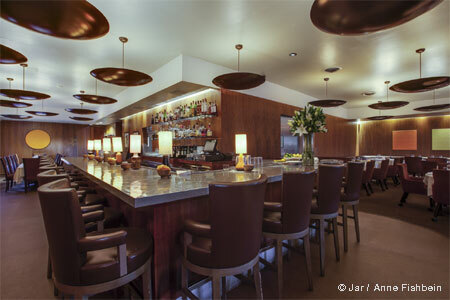 The restaurant is a collaboration between chef Alex Chang (formerly of Vagabond Restaurant & Bar in Miami) and Bar Lab, the hospitality company also behind the rooftop cocktail bar Broken Shaker.